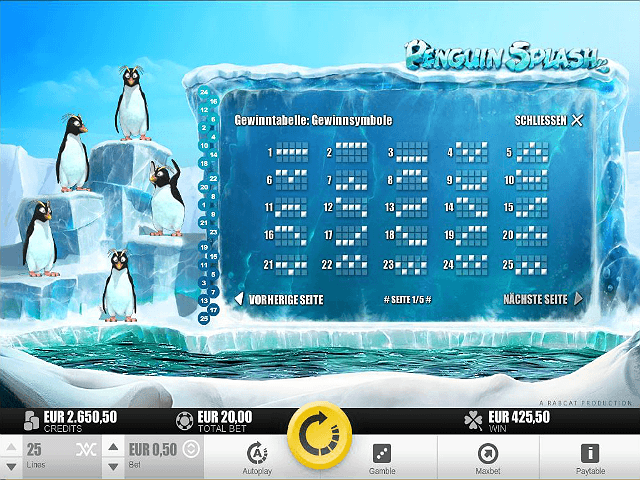 Riding in the wake of the popularity of movies like Happy Feet and Madagascar, software developer Rabcat has created a charming and fun-filled animated slot populated by none other than mischievous (and lucrative) penguins. This five-reel, 25-payline game is based around the antics of these penguins in Antarctica, who animatedly watch the action from the side of the reels. Rabcat brings these adorable creatures to life with smart, up-to-date animation that make them the true stars of the game. 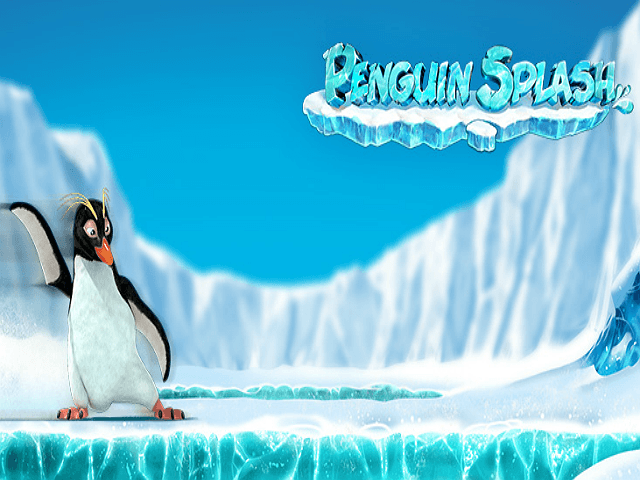 Flip your way through our Penguin Splash review to find out why you should join the penguins out on the ice. 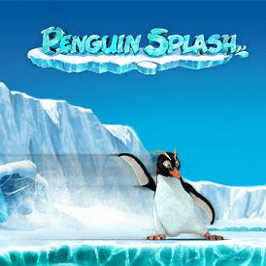 Play Penguin Splash for Real Money! €1,500 Welcome Bonus + 150 Zee Spins + 500 Zee Points! The world’s casino capital is unrivalled in its glamourous extravagance and endless entertainment possibilities. Dream Vegas has brought this exhilarating Las Vegas package to the online masses, allowing players to spin the reel or up the ante with gambling’s elite any time they want, from whichever location they desire. Cute penguin characters in this 3D video slot dance around on the ice shelves, comb back their yellow eyebrows and gaze out of the screen to make sure you're still there. They also feature on the reels as the symbols that triggers the bonuses. The natural sounds of the sea lapping against the ice accompany the call and chatter of the animals. Light, soothing music plays while the reels are spinning and there's a chorus of animal cries if you strike a winning payline on Penguin Splash. A hot return-to-player rate of 95.96% keeps the penguins on their toes. 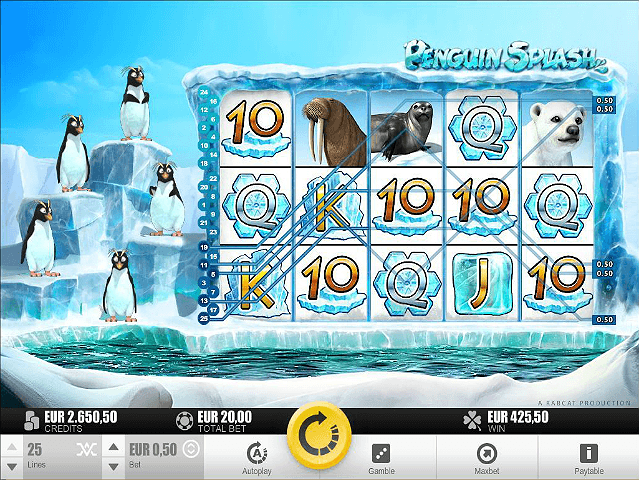 Penguin Splash has plenty of classic slot game features to keep old hands happy. It uses classic slot game symbols such as 10, J, Q and K, which pay out even if you only manage to land two of them on a winning payline. A full line of 10s pays out the same amount as the initial bet, while a payline full of Ks wins ten times the wager. The bigger prizes are won by other cold weather creatures wandering onto the reels. Seals, walruses, polar bear cubs and orca whales all feature on the board, with the whale offering the biggest payout. Landing five of these killer whales on the same payline will pay out a massive 2000 times the initial bet. The polar bear cub offers a max payout of 100 times the wager, the walrus 25 and the seal ten. The humble fish is the game’s Wild symbol and replaces all other symbols with the exception of the penguins themselves. The penguins act as Scatter symbols; receiving three or more of these anywhere on the reels will start the Free Spins bonus round. When the Free Spins round is activated, a piano soundtrack kicks in to accompany the change of pace. The reels with a penguin on them are transformed into an iceberg. For every penguin that manages to stay on the ice, you win five free spins up to a maximum of 25. If a minimum of two penguins stay on the ice, all wins are doubled during the free spins. Rabcat keeps the gameplay clean and simple, focusing on making Penguin Splash light-hearted and fun. Head to Antarctica and try your hand out on the ice – if you're lucky, you might just make a splash. Share this Penguin Splash Review today! 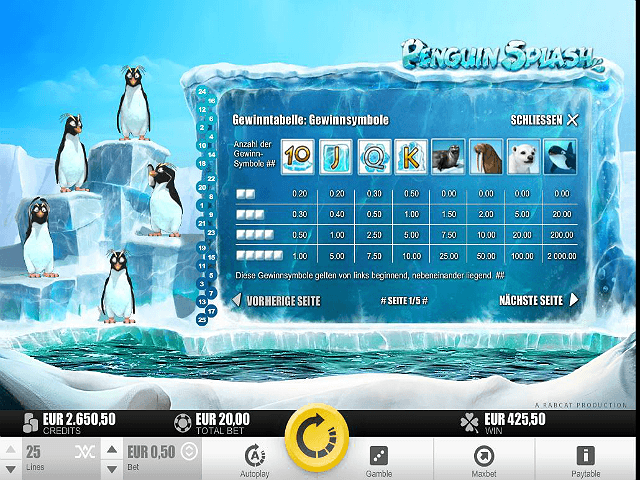 If you like Penguin Splash, you'll love these slot titles too!